It hasn't been long since I wrote the previous post about Ayatollah Makarem Shirazi and his outrageous remark, "so what if people can't eat chicken?". The remark which was made by Brent Council's favourite symbol of religious tolerance, was in reaction to the soaring price of chicken in Iran, which is spiralling out of control, as a direct result of the mismanagement of the economy. More Ayatollahs with their bellies full and their brains drained of active cells have started to join the race in making more condescending remarks about people's inability to buy chicken. Iranian exiled columnist, Massih Alinejad interviewed Hojatoleslam Shojooni by phone and asked him about the recent protests by the people in Neishabur against the soaring chicken prices. The Don Quixote like cleric rebuked the protests by the people in the birth place of Omar Khayyam by saying "This is not right to march in the streets, one shouldn't act against the regime just because of chicken prices". One wonders what exactly people in Iran can protest against? 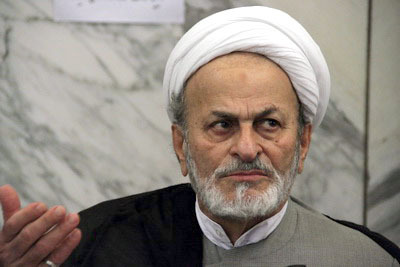 Mashad's Friday Prayer Leader, Ayatollah Alamolhoda, with his huge protruding belly, told the faithful in his sermon yesterday "Its not as if you are supposed to have the same living standards as before...if you cant have chicken then replace it with another protein based substitute". Ayatollah Alamolhoda suggested Ashkane Piaz, a soup dish with fried onions, garlic, potatoes, turmeric, tomato sauce and eggs instead of chicken dishes. Meanwhile an armed robbery on a chicken farm in Minab, Hormuzgan province, was foiled when the robbers found no chickens in the farm and they fell with their motor bike in a water canal ditch as they fled, because they were unfamiliar to the area. Maybe they're sending all the chickens to help feed their mercenary Quds force currently helping Assad murder freedom seeking Syrians! PressTV recently lauded two photo's of the Syrian army fighting the opposition. Trouble is, most soldiers had beards! And beards are Forbidden in the Syrian Army! So whereas idiotic bloated Mullahs condescend make ends meet Iranians - the monkey sez monkey do propaganda channel of PressTv continues to insult the global audience. A) By not doing their homework about Syrian military regulations. And B) By telegraphing the fact that the Iranian Regime and their gun running brother's in arms Hezbollah, have been the REAL foreign meddlers in the Syrian violence from the get go! So What if People Don't Eat Chicken?